My name is Mike J Nagle. I have been creating political maps of the world related to the 1632/Ring of Fire series since December, 2016. Some of the maps show the political situation at the Time of the Ring of Fire; that is, on May 25, 1631. These maps are historically accurate for the Original Timeline. Other maps show the situation at a later date in the New Timeline. Each map is available at full-size resolution and half-size resolution. These maps are all works in progress. While they are essentially finished, I am constantly making corrections and adding new information to them. If you last downloaded one of them more than a month ago, you may want to download it again, since it might have been changed since then. I am still creating new maps. As each is completed, I will add it to this page. I am sincerely grateful to 1632.org for allowing me to include my maps on their website. Italy at the time of the Ring of Fire. This map is intended to support the novels in the Italian Thread. They are 1634: The Galileo Affair, 1635: The Cannon Law, 1635: The Papal Stakes, and 1636: The Vatican Sanction. This is a general-reference map covering the Holy Roman Empire. It is historically accurate, except that it also shows the Ring of Fire and the County of Sommersburg, both of which, of course, are fictional. 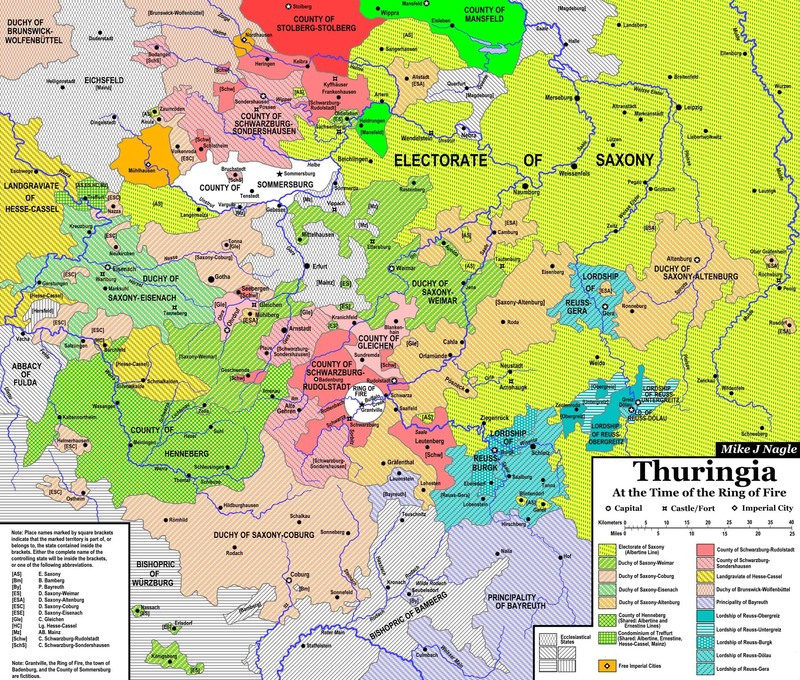 This map shows Thuringia, the part of Germany where Grantville ended up, in greater detail. It shows Grantville, the Ring of Fire, Badenburg, and the County of Sommersburg, all fictional places. Aside from that, it is historically accurate. A general-reference map showing the extent of Spanish and Portuguese colonization at the time of the RoF. 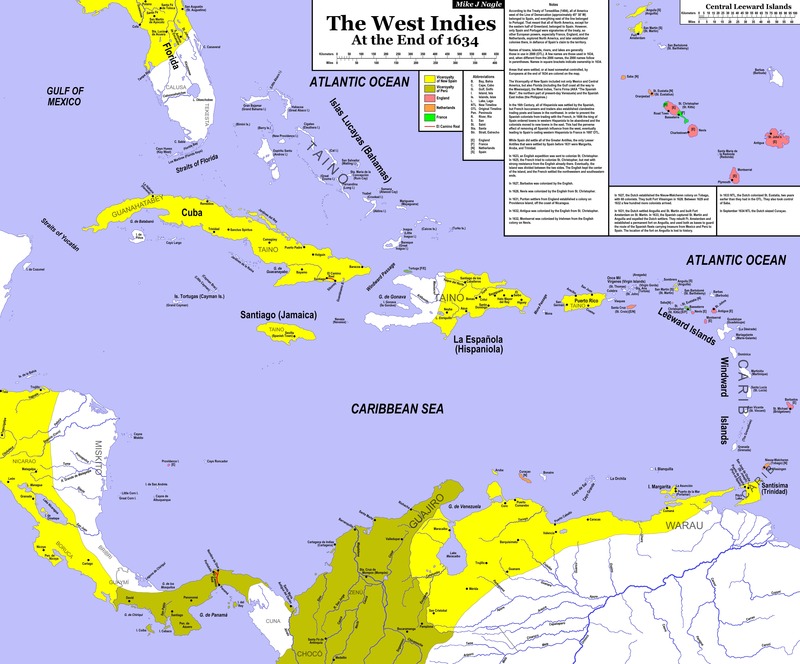 This map also shows the West Indies at the time of the RoF. This map is intended to support 1636: The Kremlin Games and 1637: The Volga Rules. A general-reference map showing the various indigenous nations of Africa and the extent of European colonization at the end of 1634. The European colonies on the Atlantic coast of North America at the time of the Ring of Fire. The European colonies on the Atlantic coast of North America at the end of 1634, after the secret treaty between France and England that transferred all of the English possessions to France for a substantial cash payment. This map to is intended to support The Danish Scheme, 1635—The Battle for Newfoundland and the forthcoming 1636: The Atlantic Encounter. The situation in New Spain at the end of 1634. The situation in the West Indies at the end of 1634. The West Indies at the Time of the Ring of Fire can be seen on the South America map, although at a much smaller scale. This map includes about a dozen towns and several rivers in the West Indies and South America that were not included on the South America map. The situation in India at the end of 1634. This map is intended to support 1636: Mission to the Mughals. The situation in the East Indies at the end of 1636. A general-reference map of Southeast Asia at the end of 1636. 1636: The China Venture is currently in the works. Sometime in the hopefully-not-too-distant future, it should be published. When it is, the situation in southern China, Formosa (Taiwan), and the Philippines will certainly need to be revised to reflect the NTL changes that will be introduced by the novel. Meanwhile, Formosa and the Philippines are not accurate for the end of 1635 (NTL). They are only accurate up to the end of 1635. 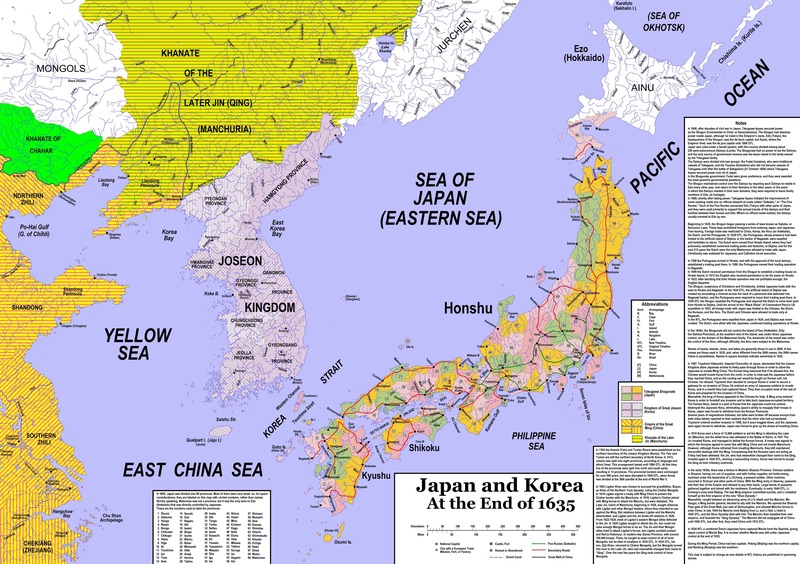 The situation in Japan and Korea at the end of 1635.